If Hillsboro High School head coach Joey Moss drew up a blueprint for what he would want in a building block for his program, that blueprint would look exactly like Trae Haywood. 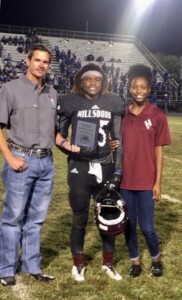 The senior tailback symbolizes what Coach Moss has constructed at Hillsboro and is the reason when asked about the Dave Campbell’s Unsung Hero Award presented by Texas Farm Bureau Insurance, he was lightning quick with his answer. Trae has lived with a guardian family of a fellow student since his grandmother’s health became too much of a challenge for her to live on her own. She’s now in an assisted living residence. Trae battles diabetes, which means a good diet is mandatory. He’s on Hillsboro’s seven-person Football Leadership Council, a group that Coach Moss says is extremely important for team unity and success.